There will be a Community Meeting on Monday 4 September, 6pm at the Kings Centre, King Sq. PG Group will be attending the meeting. We will be discussing their proposed changes to the pre-commencement conditions, their programme of work and the commissioning of the Cultural Plan for the site. On 8 August PG Group submitted an application to vary the conditions attached to the planning permission gained by Fifth Capital in October 2015. The application has to be determined by Tuesday 07 Nov 2017. The application and supporting documents can be found on the Council’s planning portal. Public comments can be submitted via the portal. There are many pre-commencement conditions that have to be dealt with prior to demolition. This impacts on feasibility and deliverarbility of the project. Planning permission expires in July 2018 so there is limited time. Delaying some of the conditions until after demolition will allow for site constraints to be properly assessed, investigative works and preparation of a suitable construction contract. The Carriageworks is unsafe and therefore needs demolition of the rear wall and internal structure (see justification below). You might recall that at the last community meeting in April we heard that there is a Bristol based developer who is likely to take over development of the Carriageworks site from Fifth Capital. We are not yet able to confirm the identity of that developer. However, we can with an optimistic tap on the keyboard invite you to a Community Meeting on Wednesday 14th June, 6pm at the Kings Centre, King Square. Further details about the meeting will be published earlier that week but you might want to put the date in your diary – it should be worth coming along! 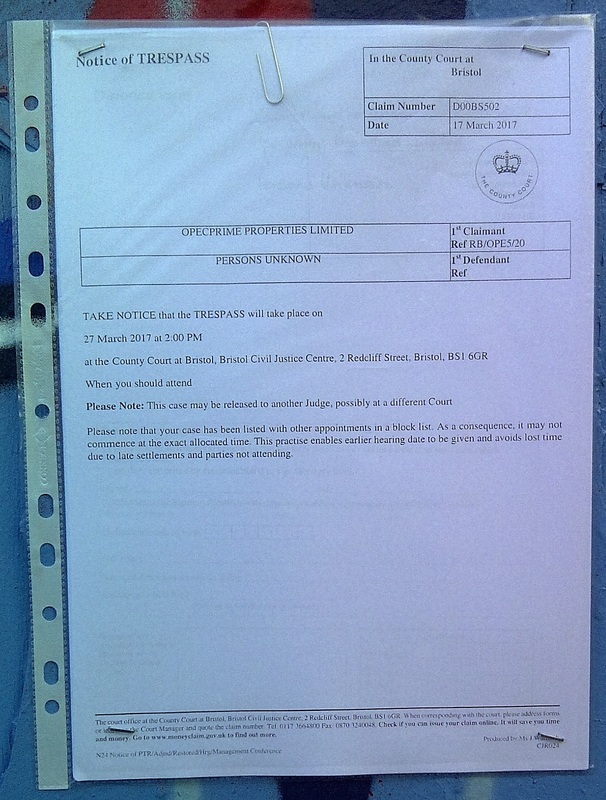 On Wednesday 22nd March a Notice of Trespass was posted on the Ashley Road gates to the backland at Westmoreland House / Carriageworks. The Notice has been served by the site owners, OpecPrime Properties Ltd (sometimes referred to as Comer Homes). It is dated 17 March. There will be a hearing to consider the trespass at the County Court, 2 Redcliff St, on Monday 27 March at 2pm. For many (possibly 10) years the site has been occupied by a group of travellers. Our understanding has always been that they were on the site with the consent of OpecPrime in order to maintain site security. This followed a number of deaths on the site when people gained unauthorised access to the buildings. In October 2015 Fifth Capital, which has an option to buy the site from OpecPrime, gained planning permission for the redevelopment of the site. For this to proceed vacant possession will obviously be required. In all of CAG’s contact with the travellers since 2011 they have always accepted that they would eventually need to move, although they were naturally concerned about having sufficient notice to allow them to find move-on sites. Similarly CAG have been anxious to ensure, for reasons of community safety, that there is no break in site security. On a number of occassions Marc Pennick, the Director of Fifth Capital, has made statements to the effect that he would give the travellers 6 months notice to move (see notes of community meeting, 10 September 2015). The planning permission granted to Fifth Capital states “No development shall take place including any works of demolition until a construction a (sic) method statement in respect of construction environment management plan has been submitted to, and approved in writing by the Local Planning Authority. The approved statement shall be adhered to throughout the construction period. The statement shall provide for…..Procedure for the sensitive relocation of the existing occupants of the site” (page 15). CAG hopes that at Monday’s Court hearing Fifth Capital’s past commitments to give the travellers 6 months notice to vacate the site will be honoured and that thereafter full site security will be maintained without any break in service. The Carriageworks Action Group and our work to bring about the redevelopment of this long derelict site has received a write up in the prestigious Urban Design Journal (issue 140). The author is Rowan Mackay, a Bristol based urban designer and researcher, who has been tracking our progress for some time. 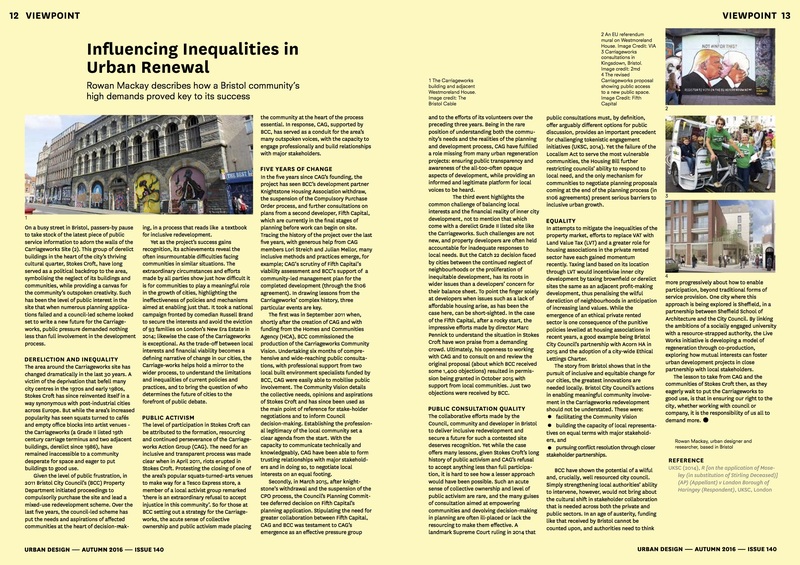 Rowan sets out the national and local context of dereliction, redevelopment and the difficulties that communites often face in engaging with major proposals. He sees three key events in the success of CAG’s work to date. Firstly the creation of the Community Vision and CAG’s ability “to communicate technically and knowledgeably, ….to form trusting relationships with major stakeholders and in doing so, to negotiate local interests on an equal footing”. Secondly the Planning Committee’s instruction to Fifth Capital in October 2015 to work with CAG and improve their proposals. And thirdly, the efforts of Fifth Capital to engage with and understand the issues faced by the local community. pursuing conflict resolution through closer stakeholder partnerships. But as the article concludes, if we are to secure our rights to the city “it is the responsibility of us all to demand more”. That’s our challenge in the coming months. It’s now a year since Fifth Capital were given planning permission for the Carriageworks. At that time we all hoped and expected that they would get on site quickly and by now be making significant progress on building their scheme. In the event the paperwork for the planning permission (namely the S.106 agreement) wasn’t completed until July. We then hoped that the purchase of the site would be quickly completed, but that still hasn’t happened. Furthermore Fifth Capital have not yet found an end purchaser, despite discussions with a number of Housing Associations, and a contractor isn’t yet confirmed. Fifth Capital tell us that the reasons for the delays are outside their control, which is probably true, but they are understandably causing frustration in the community. ‘When will it start?’ and ‘Will it ever start?’ are the two big questions. To discuss this, and get a sense of what people want to happen, we will hold the next community meeting on Wednesday 16 November (venue to be confirmed, time probably 6pm). We will invite Marc Pennick, Director of Fifth Capital, to attend along with the City Council. In advance of the meeting we would like to have as many questions as possible for Marc Pennick, the Council and anyone else you can think of. We hope that they will come to the meeting with answers but it is only fair (!) to give them a bit of time to come up with answers. If they’re unable to attend we’ll ask that they send answers to your questions in time for the meeting. Please send us the questions you want answered. Use the “Leave a Reply” box at the bottom of this page or email us at ideas@carriageworks.org.uk. You can also send questions via Facebook and Twitter. We’ll collate all the questions on our website and the answers once we have them.